Moon Rock Boxes. - A REAL piece of the Moon! | Moon Rock Boxes. << Back Moon Rock Boxes. - A REAL piece of the Moon! 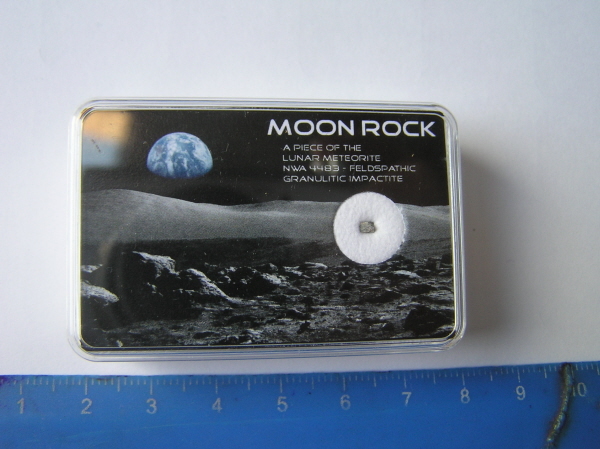 The set is a small fragment of real Moon rock, securely mounted in a super little plastic box. They use a variety of Lunar meteorites but I can guarantee every meteorite is totally genuine. The boxes have a colour image on the front, and a certificate of authenticity on the back. . The frames measure 5cm x 3.5cm and the meteorite fragments weigh roughly 10 Milligrams. ( The weights are marked on the certificate. These really do make fantastic gifts for any fan of astronomy. Whenever I offer these at shows they always get much more interest than any other item on the table! My supplier has told me he has sold over 20,000 of these sets have been sold to date so you can see how popular they are! You will also receive a free A4 Meteorite information sheet. - created by Mark Ford the Chairman of BIMS - the UK and Irish Meteorite Society.